Chick-fil-A Like Breakfast Bowls – What's for Dinner Moms? I tend not to get breakfast as much as the closest Chick-fil-A to us is 40 miles away. I try to get there as often as I can for lunch or dinner but breakfast only happens if we have an early appointment at the doctor. My kids both thought this was really good. We love having breakfast for dinner every once in a while as it seems like such a great treat. Both kids were excited when I told them what we were having for dinner. I used breakfast sausage versus chicken but if you have some leftover chicken strips or nuggets you could easily warm them and substitute them for the sausage. tip: Using the tater tot crowns or minis cuts down on the time needed to make this dish. These cook in as little as 15 minutes and are nice and crispy which my family prefers. 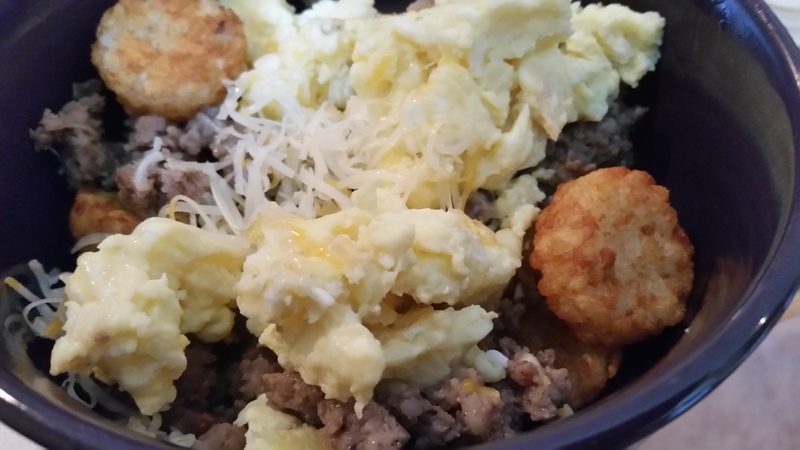 To assemble bowls divide potato tots, breakfast sausage, and scrambled eggs among 4-6 bowls. Sprinkle with cheese while hot and serve. I love Chick-fil-A. I’m lucky to have one within 5 minutes of my house. I also love breakfast for dinner. I had it many times as a child. I can always count on you for another delicious, simple meal. I usually have most of the ingredients without shopping. Thank you! That is goal to encourage people to take what they have a cook with it. Enjoy real food with your family and friends. Make it your way! You can never go wrong with chick fila or especially with breakfast for dinner! Looks delicious! Breakfast for dinner is always a nice switch up. Thank you for sharing, Marci!